Earle Dickson probably never imagined that his invention would one day be used as a zucchini stem repair mechanism. 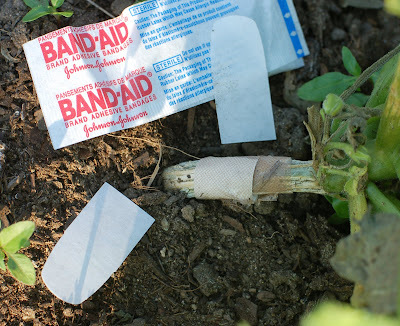 But a Band-Aid is exactly what I employed to perform first aid on my ailing plant. The leaves that were spotty-yellow two weeks ago have since dried up and fallen off. The rest of the leaves seem to be staying green, and a few of the blossoms have opened up now. Hurrah! It appears that my strategy is working; if not to heal the stem, the Band-Aid is at least keeping it from splitting any further. I also mounded up the soil around the stem to give it more support. One reader left me a comment asking if the plant might be afflicted with mosaic virus. Having never heard of mosaic virus, I did a bit of research and found Cornell University's Vegetable MD Online. 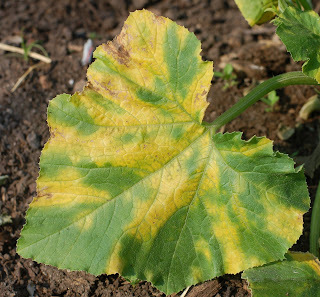 This site has a tool for diagnosing diseases of cucurbit plants. It's particularly helpful in that it shows actual photos of problems that affect different parts of the plant. The downside, though, is that when I look at these kinds of photos too much, I start to think my poor zucchini plant has any number of diseases! Since it seems to be doing better now with the patched-up stem, I don't think it was a virus issue. I think the top-heaviness of the leaves caused the stem to burst, and now, with a little extra support, the plant is able to hang on. No sign of any zukes yet, though. One year I used masking tape to repair a zucchini stem and it worked, so have hope! I can't wait to see if this works. You might have new product band-aides for plants? Have you tried duct tape? I used it on a dogwood that I had weedwhacked and took about an inch of bark off the small just planted tree. It did ok for two weeks but just the other day the new shoots started to wilt so I guess this may not be another one of a thousand uses for duct tape. Someone told me that I should have looked for the piece of bark and put it back on then taped it but that advice was too late to do the tree much good. Christa, you totally crack me up -- it's an ingenious solution! I still haven't put in any zuke plants yet, but plan to, and I will keep your most excellent solution in mind in case I run into the same problem. I really enjoyed reading this post. I love the band aid use! 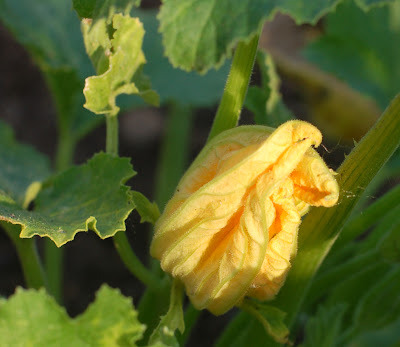 Some of my courgette and squash plants have leaves like yours so it was useful to know that your plant is still doing ok. Funny! Great solution. I'll keep my fingers crossed for you. Tee hee, how funny! I've used knitting yarn, masking tape and cello-tape to hold together a broken stem. But never a bandaid! It's cute. I love the band-aid repair job... I'm pulling for your zucchini! Now you'll need to be giving regular updates on the zucchini's status. Necessity is the mother of invention, alright! I can see it now...colorful, flowery bandaids in my favorite garden section! I'm going to try that on my zucchini plants, all 6 of my transplants are having that exact same problem! A Band-Aid. LOL!! I love it!